During my morning prayers each morning during this season of Advent, I have been using the prayers and reflections in the ‘Prayer Diary’ of the Anglican mission agency USPG (United Society Partnership in the Gospel). USPG was formed as the United Society for the Propagation of the Gospel over half a century ago when two agencies, SPG (Society for the Propagation of the Gospel) and UMCA (Universities’ Mission to Central Africa), came together in 1965. SPG has a starring role in a special Christmas edition of the BBC’s Call the Midwife. The show follows the fortunes of the midwives and nuns at Nonnatus House, in East London, in 1961. 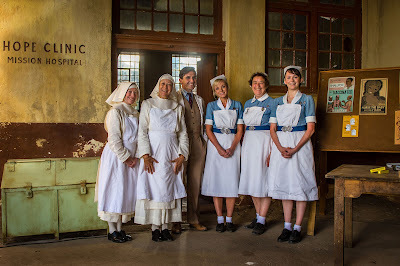 In the Christmas special, the Revd Tom Hereward and a number of the sisters and midwives are sent by SPG to help a struggling clinic in South Africa. USPG played a significant role in helping the BBC to research the episode, including input from the USPG General Adviser, Canon Edgar Ruddock, who was a mission companion in South Africa in the 1980s. As a special thank you to Edgar – and much to his surprise – the show’s writers named the character of a coroner after him; look out for Edgar’s name on a brass plaque on the coroner’s office door in the new series being screened next year. Mission has changed a lot since the 1960s. We used to think of mission as something that ‘we over here’ did for ‘them over there’ – but now we understand that mission is ‘from everywhere to everywhere’. There is no one part of the Church that has the monopoly on Christian understanding – instead we are all learning from each other. For USPG, mission is an adventure. In recent years, USPG has supported a Cuban doctor to work in Uruguay and a Ghanaian priest to work in The Gambia. Mission today is about a global network of Christians who all have needs and skills, something they need to learn and something they have to share. The days of Call the Midwife may be behind us, but USPG has also prepared a Christmas Nativity play that contrasts the experiences of the Holy Family and a modern rural couple in Bangladesh who have been supported by USPG trained midwives. We are approaching the end of the third week of Advent. Throughout this time of preparation for Christ’s coming at Christmas, I am praying each morning in Advent and using for my reflections the prayer diary of the Anglican mission agency, USPG (United Society Partners in the Gospel). 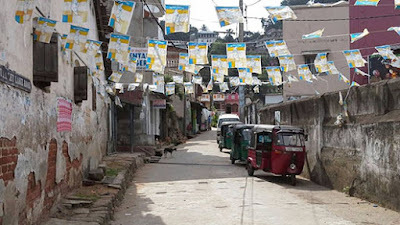 Pray for inner transformation for those within tea plantation communities that are struggling with alcoholism, domestic violence and child abuse. Isaiah 56: 1-3, 6-8; Psalm 67; John 5: 33-38.